When was the last time you had a “Why?” phase. I’m having one now. 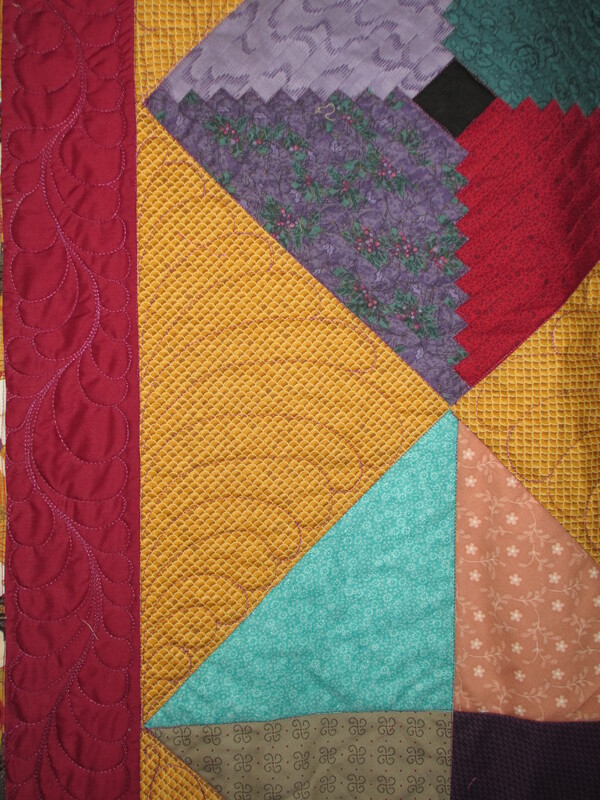 Lots of weird things going on, good things, bad things, twisted things and things I don’t understand… with me asking, “Why?” I haven’t had any customer quilts since my last post. 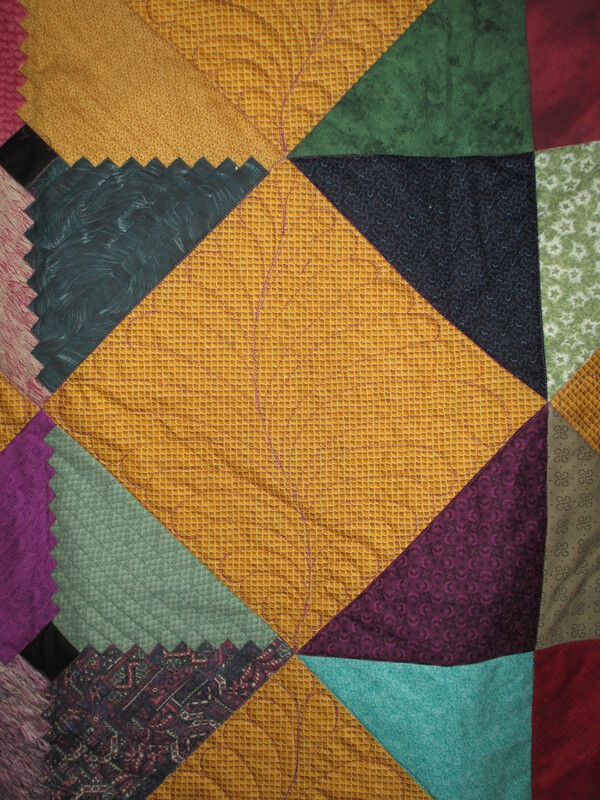 Autumn is supposed to be the busiest time of the year for a quilter, when he or she is finishing quilts for her customers to give as Christmas presents. I haven’t had any customer quilts in over a month. Why? One of the things that happens when you lose a loved one is the reliving of memories. As we cleared out part of her house, we ran across my MIL’s recipe boxes. My husband spoke of his mother making biscuits with chocolate gravy for him and his brother when they were small. He found that recipe in the recipe box and made it for us for breakfast this past weekend. To distract myself from dwelling too much on the “whys,” I’ve been working on my never ending “to do” list. I have only a few pictures to share. First off, I finally finished a charity quilt I’d had for awhile. I filled it with feathers, but they are not my best feathers – that was the day the doorbell kept ringing, which made the dog bark non-stop (someone was working on our broken porch, but they haven’t finished it yet – that was Sept. 25), and the phone rang off the wall as well. I was one jumpy quilter that day. I also made a floor cloth to put under my kitchen table. I have wooden floors in the kitchen that are sun-bleached and worn out. Since I can’t get them fixed right now, I just made a floor cloth out of a painter’s drop cloth. I painted the squares and then antiqued the cream color and finished it with polyurethane. It goes with the old world French bistro theme in my kitchen. Speaking of floors, I’ve also been working on the stairs to my basement, but I will tell you more about that later. 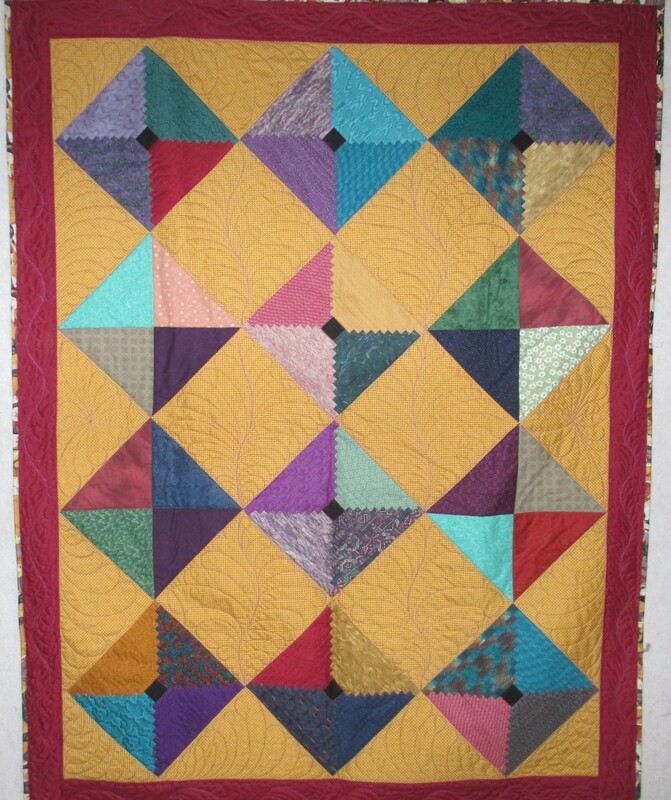 For now, I’m just tickled that I actually have a quilt top of my own pieced together and ready to quilt. I haven’t made a quilt for myself in about 1 1/2 years, so this feels good. I’ve got another that I am hand appliqueing, but that won’t be done for some time. And, of course, I have tons of them drawn out on paper and in my head. Lots and lots of other stuff going on here and ideas and projects on my “to do” list, but my brain is turning into mush. Why? I don’t know.